Tips and plans for growing lima beans in your home vegetable garden. Learn how to plant, care for, harvest and store lima bean plants for best gardening results. Lima beans offers a surprising taste treat for gardeners who usually cultivate the snap bean variety. Limas, freshly shelled from home grown vegetable gardens provide a tasty sensation as side dishes for homemade family dinners and potluck suppers. This delicious bean type grows in pole, bush, or climbing varieties. 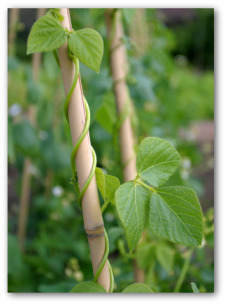 A major drawback for gardeners who lack vegetable gardening space is the long season required for lima beans. For example, Henderson Bush Lima takes 65 days before harvesting begins. Pole limas need an even longer growth period of about 85 days before pods can be harvested. The slow growers pose no problem for Southern gardeners or other warm-climate regions that have adequate room to grow and time on their hands. • Fordhook is the most popular Lima variety to grow. • Limas are very sensitive to cold weather, much less frost. • Test your soil and provide growing lima beans with a soil pH of 6. • Plant in spring a few weeks after planting snap beans until early summer. • Leave a distance between plants of 10 inches. • Rows should be spaced 3 feet apart. • Keep soil moist during germination. 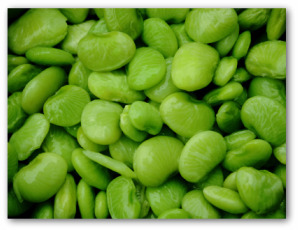 Once the lima beans reach around six inches high, apply manure as side dressing. Place natural fertilizer on either side of the plant, no closer than 2 inches, to prevent burning by direct contact. This is especially true of chicken manure, which should only be used for digging in the soil in the fall for next year's planting. Mulch topsoil to maintain moisture. Many gardeners inoculate lima bean seeds with nitrogen-fixing bacteria. However, in warm-climate regions sufficient bacteria exist in the soil and treatments are usually not necessary. If feedings are needed while plants are producing, as indicated by yellowing or browning of the foliage, use a low-nitrogen product at the recommended rate. Growing lima beans, which have a shorter harvesting season, (because they took their sweet time growing!) are ready when the beans are prominent in the pods. 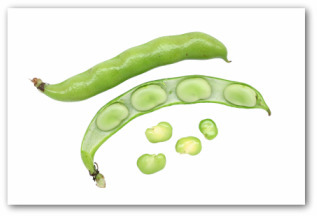 For dried lima beans, gather pods when they have turned brown and the seeds rattle inside. In garden folklore, the saying goes, "On Valentine's Day sow beans in clay" or "On Candlemas Day (Feb. 2) sow beans in clay". In 1752, the Gregorian calendar replaced the Julian calendar in North America and the UK, so eleven days were lost and Candlemas Day was followed the day after by St. Valentine's Day. Plant garden beans when the sign is in the scales; they will hang full. This refers to moon planting, under the sign of Libra. Sow beans on St. David's or St. Chad's (March 1 and 2), be the weather good or bad. • Break up compacted soil to allow it to breathe naturally. • Expose pests to deadly cold and predators. • A lot less mulch will be needed due to "earthing up".